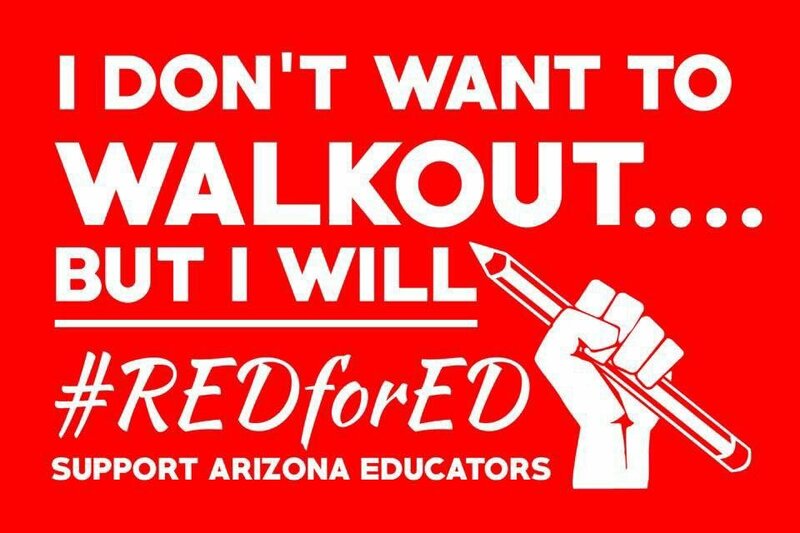 As an Arizona Advanced Placement Economics educator, having taught since 2004, I have decided to walk out on Thursday April 26. Here is why, ranked. My average class size is 33.1 students per class. I have taught classes as small as eight, and as large as 36. Optimal class sizes are somewhere around 16 students. Increasing my pay will not alleviate my number one problem with education in Arizona. This many students in one room is bad for education. It does not promote learning, in fact it diminishes potential learning opportunities. As a result of so many students, I am easily spending 60+ hours per week working. Those who would argue that teachers have it easy because they have summers off just do not get it. The infrastructure provided to me is insufficient. As a result of trying most of the technology offered to me by my district, I have opted instead to use my own technology. I have my own computer, iPad, iPhone, projector, cables, teaching desk and chair, student whiteboards, even markers. I am using my own supplies (and labor) to keep student desks disinfected and clean. I supply clean water to my classroom and am currently buying approximately 25 gallons of water per week. My pay is insufficient. I have a Bachelor's Degree, a Juris Doctor and I am working on my Master's Degree now. My base contract for next year, including 301 money, is $40,900. It is exactly the same as this year. I have worked as an educator since January, 2004. Before that I was an attorney. I have worked in eight different schools on four different continents. I have taught extremely large classes, extremely small classes, and virtually every social studies class one can think of. I have taught students as young as seven, and having taught other educators, I can say that I have taught students in their seventies. During these past three years, I have served as an Arizona educator. I now teach exceptionally gifted students (many of whom qualify for free and reduced lunch and are minorities) in a basement classroom with no windows. I have taught Flinn Scholars, Questbridge recipients, and students who graduate from the United States' most elite universities. I love my job. I love helping students become thoughtful citizens, ready to solve problems facing us. What I cannot stand is that my love for what I do is being taken advantage of by Arizona's leadership so that corporations doing business here can pay lower taxes. This short-term thinking is robbing the rest of us of far too many opportunities. Increased pay will not be enough for me. I want to work in a classroom with a reasonable number of students, where appropriate infrastructure is provided by my employer, and I can be paid fairly for the hard work that I do. I want to be able to look students in the eye and say that we have given them all of the tools they need to succeed in meeting my expectations for them. I expect nothing less, and in every other place I have worked, I have received those things. Because up until now our state leadership has heard neither me nor my colleagues, I will walk out on Thursday. Perhaps this will help these leaders open their eyes and ears to the plight facing educators and students, and encourage them to fund a better learning environment for next year's students. I am not walking out ON my students. I am walking out FOR my students.